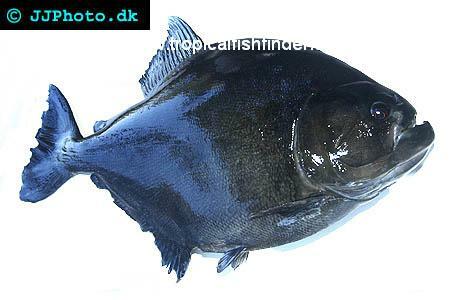 Serrasalmus rhombeus is one of the more variable piranhas. The standard form is dark charcoal grey with red eyes and a limited amount of red colouration around the cheeks and gill covers. There is a dark humeral spot just behind the gill opening, but it is indistinct and difficult to see against the overall dark colouration. Specimens from the Guyanas tend to be more slender than those from Brazil and Peru, the Peruvian form especially being recognised for its "high back". Some varieties are notably darker in colour than others; generally specimens from Brazil being lighter in tone than those from elsewhere. The "Diamond" and "Gold" varieties from the Rio Xingu have shimmering scales on the flanks. The black piranha is notorious for being one of the species known to bite humans. Handle with extreme care. An aggressive, territorial loner; keep in a spacious tank on its own. Juveniles are sociable, but as they age they become increasingly aggressive towards one another. Requires good water quality to do well. Filtration should be substantial, and regular water changes are essential. Water chemistry is generally not critical provided extremes are avoided, but the Rio Xingu varieties will do best in soft, acidic water with slightly more heat than normal. Feeding is simple, as these fish will eat most foods including whitebait, lancefish, chunky seafood, earthworms, river shrimps, etc.